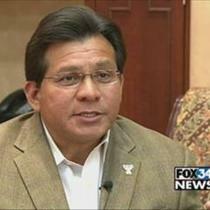 Alberto R. Gonzales, who became a controversial figure as Attorney General during the Bush administration, will become a professor at the newly created Belmont University College of Law in Nashville, Tenn. The university announced in a press release that Gonzales will fill the endowed position as the Doyle Rogers Distinguished Chair of Law on Jan. 2. The law school opened its doors in September. Gonzales is currently a Visiting Professor and minority/veteran recruitment consultant at Texas Tech University. Gonzales was nominated by President George W. Bush and confirmed by the Senate as the 80th Attorney General on Feb. 3, 2005. He served in that post until September of 2007. Posted: 10/3/11 at 3:28 PM under News Story.